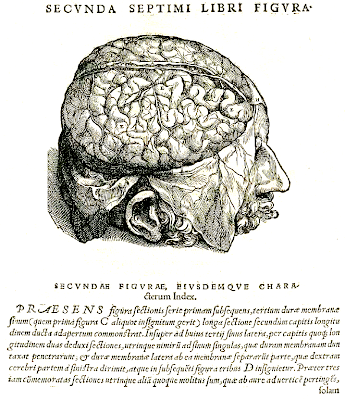 Andreas Vesalius, De humani corporis fabrica libri septem (1543). Plate 606. And here are trees and I know there gnarled surface, water, and I feel its taste. These scents of grass and stars at night, certain evenings when the heart relaxes -- how shall I negate this world whose power and strength I feel? Yet all the knowledge on earth will give me nothing to assure me that this world is mine. You describe it to me and you teach me to classify it. You enumerate its laws and in my thirst for knowledge I admit that they are true. You take apart its mechanism and my hope increases . . . What need had I of so many efforts? The soft lines of these hills and the hand of evening on this troubled heart teach me much more.